1. Jim and Pam from The Office. Jim and Pam! I know I am hardly alone on this one. 2. Willow and Oz from Buffy. They may be a fleeting favorite, but I just love them right now. 3. The whole cast of How I Met Your Mother (second appearance for Allyson Hannigan on this list). It's not just Lilly and Marshall or just Ted and Robin, and it's definitely not without Barney. It's the whole group that makes me feel warm and fuzzy. 4. Eric and Donna from That 70's Show. I want to be friends with them. 5. Joey and Dawson from Dawson's Creek, but only when they're not actually a couple. 6. 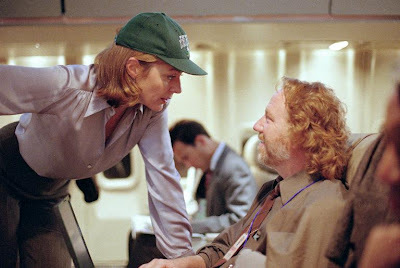 CJ and Danny on The West Wing. Smart, sophisticated warm fuzziness. You may say to yourself, "But wait! Surely a DeGrassi TNG couple made the illusive list. Paige and Spinner? Paige and Alex? Liberty and JT?" Well, as much as I love the Canadian teenaged dramas--and you know I do--I haven't found the warm fuzzy coupleness from the Great White North that I have from American network TV. And DeGrassi provides so much more than just hormones. After all, they go there.